Currently 898 albums. (Not counting the miscellaneous section with singles. No compilations which include same tracks as the original album etc. although he never saw himself as a typical studiomusician. Along with his brother Randy they did lots of sessions. I tried to make the discography as complete as possible but it probably will never be complete. If you have additions please let me know. Bootlegs are not included. 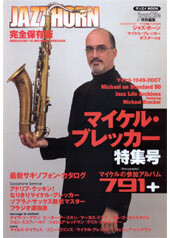 Thanks to the Japanese Michael Brecker fanclub. They did a great job in finding all titles. A discography was published in Jazz Horn which I used as a guideline. - Cindy Valentine "Secret Rendez-Vouz"
- Maxine Nightingale "Love Lines"
- Mike Green "Pocket Of A Thief"
- Tom Snow "Uptown Hopeful"
- Pierce Arrow "Pity The Rich"